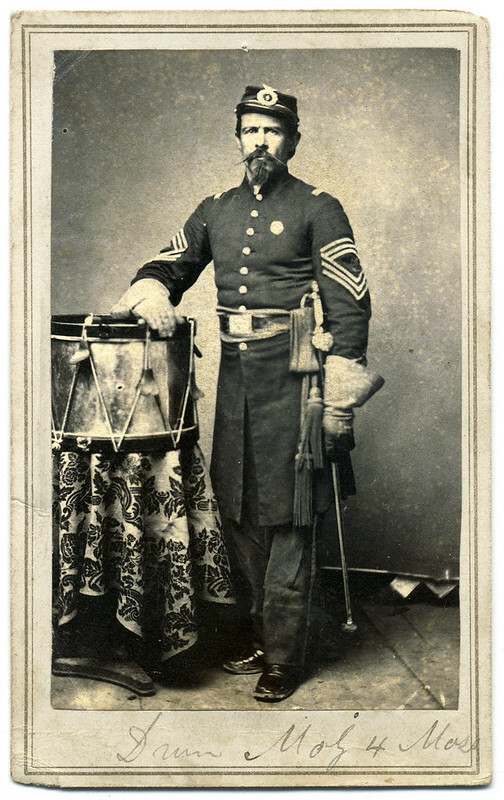 The period ink inscription on the mount of this carte de visite indicates that this drum major served in the Fourth Massachusetts Infantry. The regiment was organized for a three-month enlistment in 1861 and a second enlistment for nine months in 1862. The individual who held this rank in 1861 was George W. Pope. The companion image to yesterday’s post is this carte de visite by an anonymous photographer. An individual wearing a Morse Diving Helmet and an insulated suit stands in a photographer’s studio. 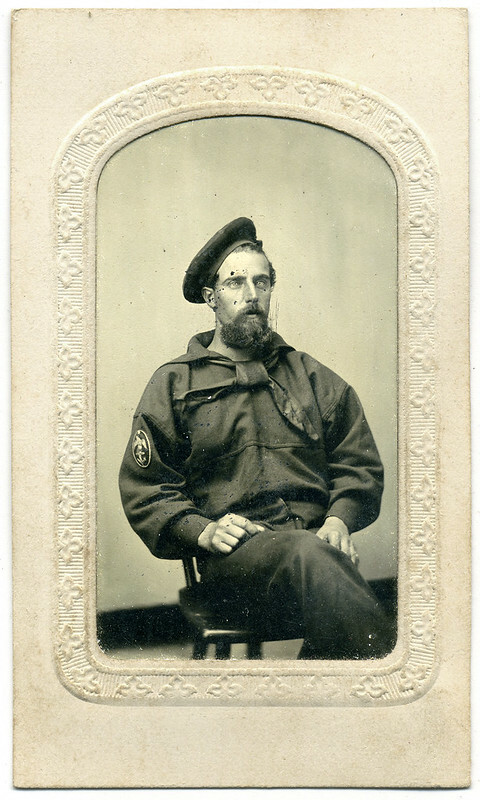 A modern pencil identification on the back of the mount of this image names this diver as “Hyde,” and is associated with a tintype of a man in the uniform of a Union sailor. According to a previous owner, the sailor’s first name is George. There is however no record of a George Hyde in the U.S. navy during the Civil War period. 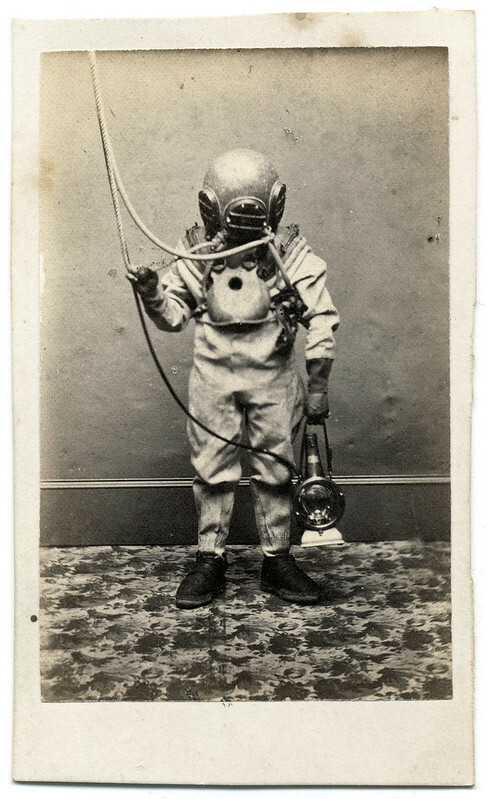 This tintype in a carte de visite mount by an anonymous photographer is identified in modern pencil on the back only as “Hyde.” This photo came with another image, a carte de visite of a man outfitted in a Civil War era deep-sea diving suit, his head and face covered with a Morse Diving Helmet. According to a previous owner of the photos, the sailor’s first name is George. There is however no record of a George Hyde in the U.S. navy during the Civil War period. If you know anything about a George Hyde who served in the Union navy between 1861-1865, please be in touch! Now available on New York Times Disunion is the story of John James Toffey and how he came to receive the Medal of Honor for conspicuous gallantry when he saved a skirmish line at Chattanooga. Confederate infantry and sharpshooters concealed themselves in the woods and in rifle pits dug into the banks of Citico Creek, and arranged themselves under cover of a railroad bridge and nearby buildings. I first wrote about Toffey in my 2004 book, Faces of the Civil War: An Album of Union Soldiers and Their Stories. 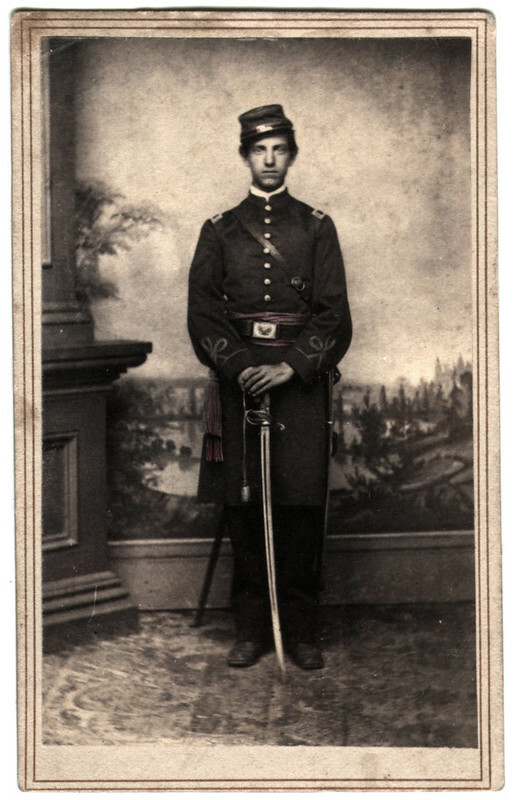 John James Toffey (1844-1911) of Jersey City joined the Union army at age 18 when he enlisted for a one year term in the 21st New Jersey Infantry. 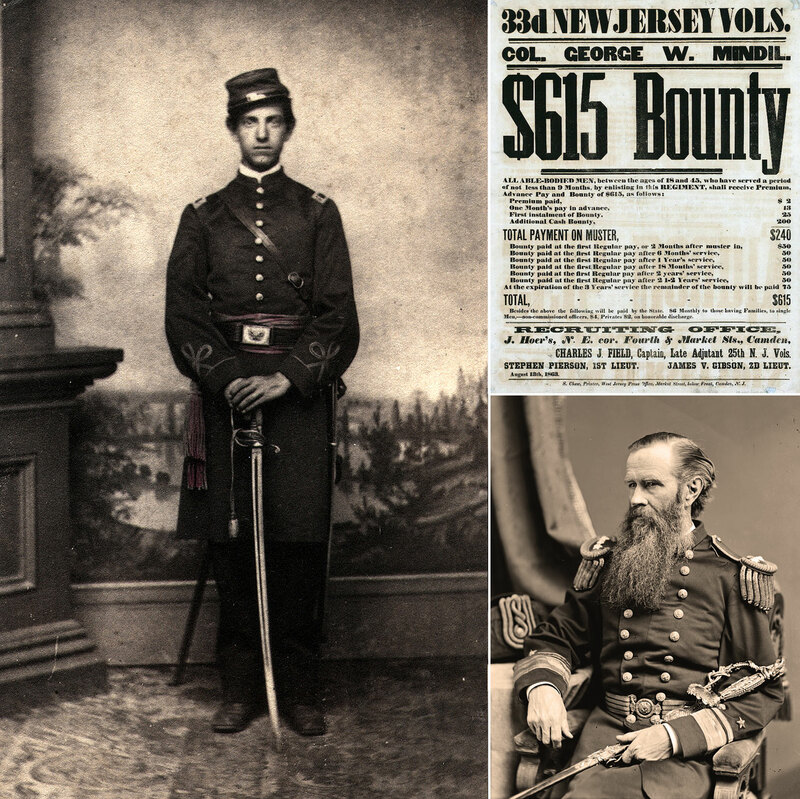 He immediately reenlisted in the Thirty-third New Jersey Infantry when it was organized in the summer of 1863. Toffey and his comrades, distinctive in their Zouave-style uniforms, reported to the Army of the Cumberland for duty and participated in the Chattanooga Campaign. On November 23, 1863, Toffey rose from his sick bed to fight in the Battle of Orchard Knob. His colonel, George Mindil, ordered him in at a critical moment: The advance line of the Thirty-third had wavered and buckled in a charge under Confederate fire. “I ran across the open field and reached the advance line in time to prevent it from breaking. I reformed the line and we again charged … just as we were carrying the position I received a severe wound,” Toffey explained. He was struck by two rebel bullets. One ripped into his right thigh at the pelvis, fracturing that bone and his leg. The second bullet caused a flesh wound to his other leg. The wounds ended his combat service, and he served the rest of the war in the Veteran Reserve Corps. He received the Medal of Honor in 1897. His “superlatively brave conduct,” noted Col. Mindil, “saved the position, and enabled us on the following morning to press forward the entire line” as it surged up and over Lookout Mountain for another stunning Union victory that spelled doom for Confederate forces under Gen. Braxton Bragg. I wrote about Toffey in my first book, Faces of the Civil War: An Album of Union Soldiers and Their Stories.